The Aran Islands has a lot to offer: The three Aran Islands, Inis Mór Island (Big Island), Inis Meáin Island (Middle island) and Inis Oírr Island (East island) are situated in a north westerly, south easterly direction at the mouth of Galway Bay, Ireland.They are famous for their geological formation, historical monuments and their linguistic and cultural heritage. The Irish(Gaelic) language is still spoken here and in the twenty first century all native born islanders are bilingual in both Irish and English. 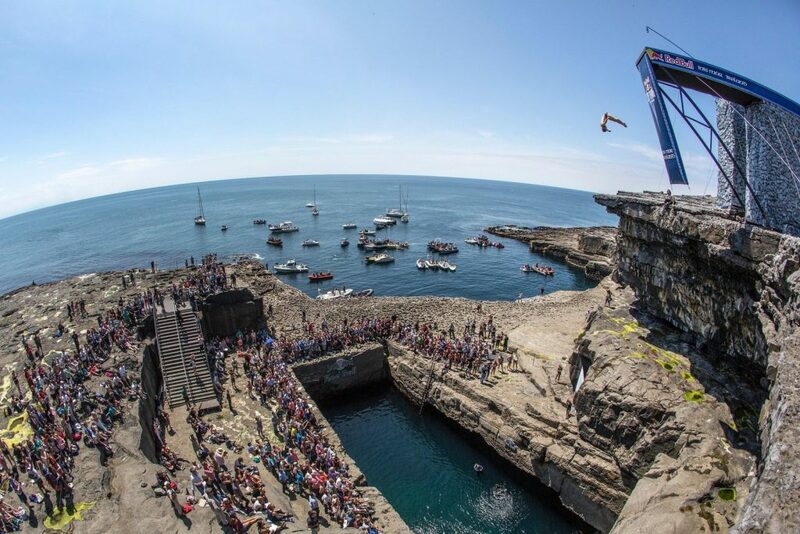 Check back with us frequently for updates on news about special events and happenings around the Aran islands… enjoy your stay on the Aran Islands!. 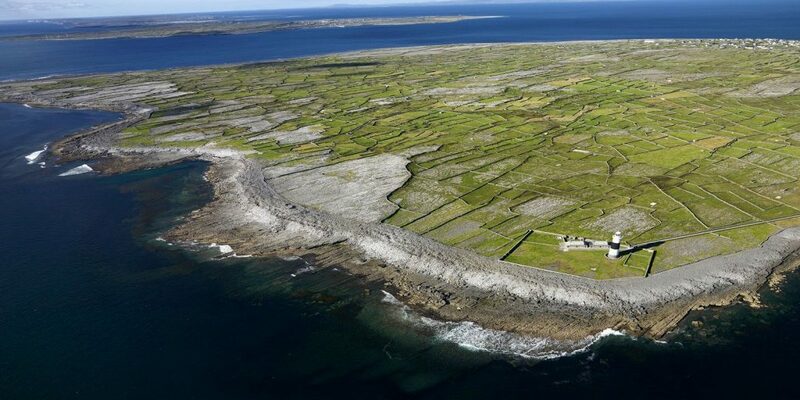 Access to the Aran Islands is via Galway – Rossaveal and Doolin. Dún Aonghasa is one of Irelands most visited attractions. Located on the 300ft cliff side or south side of Inismór, It is a semi circular stone fort over looking the Atlantic with daunting and dramatic views that stretch the length of the Island. Dun Aonghasa is deemed to be one of the best examples of its kind in Europe. Archaeologists, scholars and tourists come here from all over the world and it is likely to be given the official status of a world heritage site in the near future. 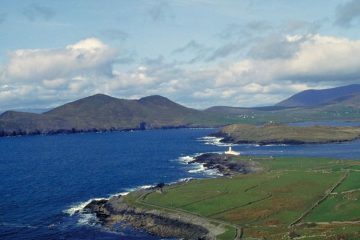 Most people cycle to Dun Aonghasa from the pier and this cycle to Dun Aonghasa has become an attraction in itself due to the electic mix of attractions along the way. A 14 acre site the fort consists of three terraced walls surrounding an inner enclosure containing a platform on the edge of a three hundred foot high cliff. The views from it are breathtakingly spectacular. Excavations carried out in the 1990s indicated that people had been living at the hill top from c.1500 BC with the first walls and dwelling houses being erected c. 1100 BC. A remarkable network of defensive stones known as a Chevaux de Frise( c.700bc) surrounds the whole structure. Late Bronze Age objects such as rings, tools, beads and foodstuffs found on site are now in the National Museum Dublin. Some scholars suggest that the platform overlooking the vast Atlantic ocean may have had ritual significance. Rental or Bike hire. When travelling toInis Mór it is recommended that you would organise accommodation prior to arriving.Ferries to the Aran Islands are available from Rossaveal (leaving Galway city) all year and from Doolin (Cliffs of Moher) from April to October. Inis Meain Island is where you’ll find a more authentic escape from the modern world. With a population of 200 people, it is the less visited of the three islands. 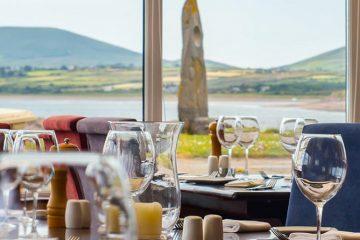 Visiting Inis Meain will give you the best chance to acquaint yourself in the precious sanctuary of Irish Cultural tradition. This island has a hilly landscape. 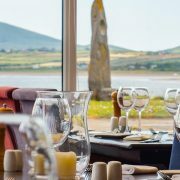 It also features crystal clear views of the cliffs of mohar. This island was a retreat for Synge, one of the most famous playrights to emerge from ireland, and features a lot of artists. More recently it has become a centre for diving with its beautiful marine life and clear waters. The island also features cultural courses such as dance and poetry. 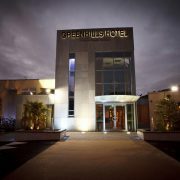 Hotel and Bed and Breakfast accommodation is available on the island. 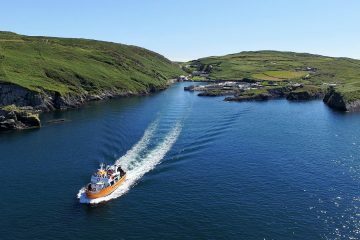 When travelling to Inis Meain it is recommended that you would organise accommodation prior to arriving.Ferries to the Aran Islands are available from Rossaveal (leaving Galway city) all year and from Doolin (Cliffs of Moher) from April to October. Inis Oirr (Inisheer) is the smallest of the islands is characterized by its distinctive charm. 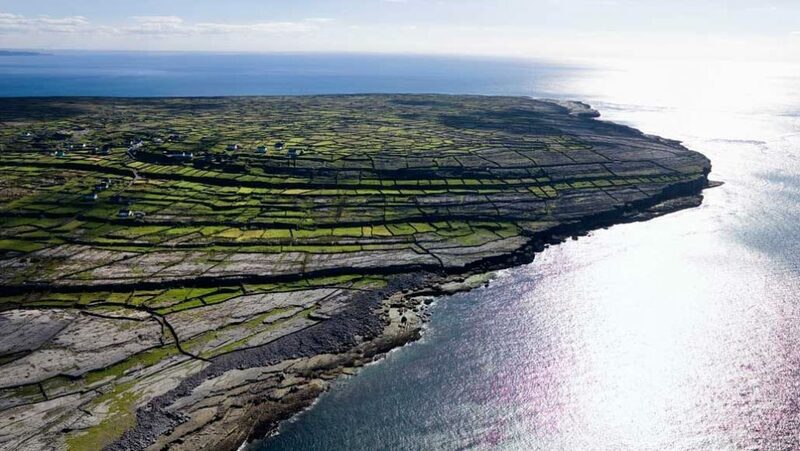 This Aran island is close to the Burren with its unusual eclectic mix of color and the Cliffs of Moher clearly visible in all its panoramic splendor. The Island itself also has the true feel of a classical isolated fishing village. From the pier you are greeted with a pristine carpeted white sandy beach facing clear crystal turquoise water and plenty of fishing boats, their nets, and fisherman returning at the end of the day with their catch. The main village area is right next to the beach and is enclosed by a small hill with a castle and a fort at the top as if they are taking care of the islanders and its visitors. The island is 3km by 3km wide with small hills and intricate little valley’s and is easily covered by foot or by bike. The walk to the lighthouse or the shipwreck of the Plassy is a great occasion where you feel the island with its diverse landscape unfold before your eyes. 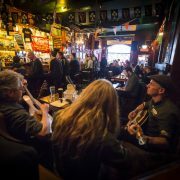 Inside the village you wil find a strong local community still adhering to the traditional Irish way of life. 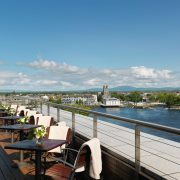 The island features a traditional music bar which is has a nationwide reputation for the finest music and great night out. The island also has an arts center, Aras Eanias and features the best in traditional music and art courses. Hotel and Bed and Breakfast accommodation is available on the island. 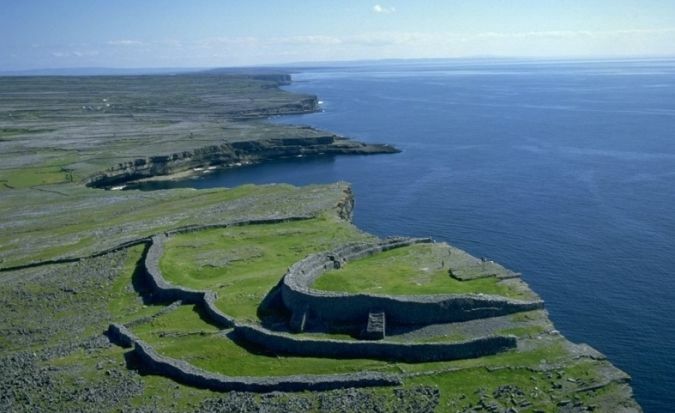 When traveling to Inis Oirr it is recommended that you would organize accommodation prior to arriving.Ferries to the Aran Islands are available from Rossaveal (leaving Galway city) all year and from Doolin (Cliffs of Moher) from April to October.